The choir is open to all regardless of ethnicity, age, religion, gender, nationality, identity, sexual orientation, disability or political affiliation and no one is excluded from membership on financial grounds. There are no auditions and the choir includes people with a variety of musical experience. We welcome new members and are interested in hearing from any keen singers who would like to join us. 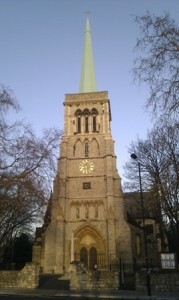 We rehearse on Sundays between 5.30 and 7.00 pm at St John of Jerusalem Church, Lauriston Road, London E9 7DL. We do not want subscription costs to be a barrier to membership. Please talk to our Treasurer about what you can afford. If you are interested in joining or just finding out more about the choir please contact the secretary, Annie Davies.